Lime and Ulcer - Are limes good for Ulcers? Home » Conditions & Disorders » Are Limes Good For Ulcers? Are Limes Good For Ulcers? Popular to contrary belief, ulcers are often due to a lack of stomach acid, NOT an excess. This may sound counter-intuitive, but this will also explain why limes, a seemingly acidic fruit, are good for ulcers. Through a series of complex biochemical reactions, Mother Nature has made sure that your digestive system works with a proper balance between several different factors. One of the most important factors with appropriate digestion is stomach acid production. When we see, think about or smell food, our brains automatically sends a message to our stomach cells to start releasing stomach acid (Hydrochloric Acid or HCl) in preparation of breaking down any food that comes down into the stomach. Our stomachs need to reach a pH level of at least 2.0 (1.0 is most acidic whereas 14 is the most basic on the pH scale) so, very acidic, in order to properly digest whatever we eat. However, that is not the only reason why our stomach has to reach that magical number. At pH 2.0, other special cells in the stomach lining work hard to secrete MUCOUS, which lines and protects our stomachs from the acidity of the HCl. This ensures that we don’t damage our stomach lining while we are digesting our food. What does this have to do with limes being good for ulcers? Well, when we are stressed or if we eat too quickly (things we do in our modern world!) our stomach either doesn’t have enough time to secrete enough HCl, or it reduces its production of HCl because digesting is the last thing our bodies are thinking of doing when we are in a fight or flight situation. What then happens is that our bodies create almost the sufficient amount of stomach acid, but it doesn’t quite hit that magic number. Which means that although we can digest (albeit slowly) the food in our stomachs, it isn’t at that 2.0 to stimulate the mucous protection layer. What does that do? It creates an environment where ulcers can form in the stomach lining. 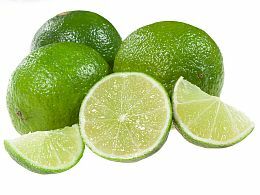 Limes contain Flavenoids that give them their characteristic flavour and scent. It is these flavenoids that stimulate your mouth to salivate, and stimulate your stomach to create Hydrochloric acid in sufficient amounts. Having squeezed fresh lime in a glass of water prior to a meal aids in breaking down the food in the stomach and creating a sufficiently acidic environment in the stomach. The Flavenoids in limes also contain anti-oxidant, anti-biotic and anti-carcinogenic properties. They will help to heal the ulcers and protect from any bacterial infections. The lime Flavenoids not only help ulcers to heal, but also to prevent ulcers from forming in the first place. The simplest way is to squeeze the juice from half of a lime into a glass of water and drink that about 10 minutes prior to a meal. Certain traditional cultures use limes in chutneys or as pickled side dishes in order to help with digestion alongside a meal. Sprinkling lime juice over vegetables and salads or even for use inside a salad dressing is another great way of incorporating lime into your dietary regimen.